Abingdon has decided at a meeting last week that the borough records shall contain a complete Roll of Honour for the town. The town has therefore been divided up for a Committee to procure the names and ranks of all Abingdon men who have served as sailors and soldiers during the war. Suggestions are being elicited for a public memorial. The Abingdon Bowling Club held another pleasant whist drive in the Roysse Room, Abingdon, on Thursday evening, when there were nearly 150 present. Refreshments were served at the interval. Messrs C. Johnson and W. Flay ably took the duties of M.C.’s. At the Abingdon Cottage Hospital annual meeting on Thursday, a satisfactory report and statement of accounts were passed, and the whole of the hon. officers were re-elected, with Mr H. Clarke as president. 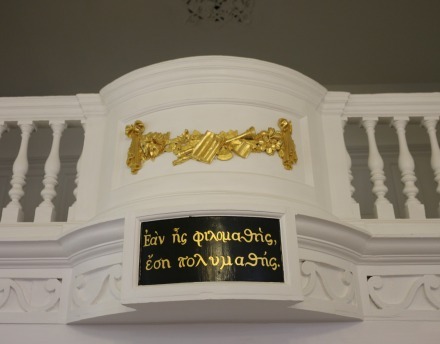 A funeral pall has been presented by an anonymous donor to the parish of St. Helen’s. A short time ago a substantial wheeled-bier was presented. The adjourned licensing meeting was held at the Borough Police Court on Tuesday, and sanction was given to Messrs Belcher and Habgood, brewers and wine and spirit merchants, of Abingdon, proprietors of the Queen’s Hotel, Market Place, to add to the hotel the adjoining premises formerly Hughes’s stationery and printing business, providing no intoxicants were sold on the new premises, and that the door leading into Queen Street be fastened up. The Rev Charles H. Gill, pastor of the Congregational Church, Long Sutton, Lincolnshire, has been invited and has accepted the pastorate of the Abingdon Congregational Church, in the place of the Rev A. T. Rose, who has resigned. A prize was recently offered by Mr Strauss, of Kingston House, to the owner of the heaviest pig at nine months at the time of slaughter, competitors to be residents in Abingdon. The prize has been awarded to Mr G. E. King, The Vineyard, Abingdon. Messrs A. Cornish and W. Cordell were the judges. The annual meeting of the Abingdon Gas Company was held on Wednesday afternoon last week, Mr Pryce presiding. The accounts showed that £3231 was available for dividends, the allotting being 12/6 per share on Original and A shares, and 8/9 on the B shares. There had been an increase of consumption of gas attributable to the supply of gas to the Oxford and Wantage motor buses, the quantity consumed by private houses being considerably decreased. Messrs Couldrey and Stanisland were re-elected auditors. A workman at the Sutton Courtenay Power Station on Thursday last found the body of elderly man floating in the stream close to the works, which, it appeared, had been in the water several days. It was subsequently found to be the body of William Roberts, aged 70 years, formerly of East Hendred. The body was dressed in workhouse clothes, but the hat and coat were missing. Mr Challenor, coroner, held inquest on Friday, and a verdict of ‘found drowned’ was returned. Alfred Day and Edmund Koley, Oxford Road, Abingdon, were fined 10s each for delivering coal without weight tickets. Day did not appear, and Koley pleaded guilty. The Military Medal has been awarded to L.-Cpl. F. G Puffit. Royal Berks, Abingdon, for gallantry and devotion in the field last November. The Abingdon Red Cross Hospital has now been closed, and the equipment lent being returned to the owners. The remainder is to be disposed of by sale. The National War Savings’ Cinematograph visited Abingdon Corn Exchange last week. Sir George Dashwood, Warren House, Abingdon, presided. A sale of work in aid of the Blind and Hand Weaving Industry took place on Thursday afternoon at the residence of Lady Shirley, of Abingdon. The articles for sale consisted of baskets, mats, brushes, etc, made by the blind. A meeting of an original character was held in Abingdon on Monday afternoon, when General J. T. Wigan, M.P.. conferred with a small committee of representative farmers in his constituency on the agricultural situation. General Wigan referred to the efforts made by the Agricultural Committee in the House to get the Government to announce a definite agricultural policy. Members of the committee pointed out that in the absence of such an announcement farmers had not sufficient confidence to invest in the land the capital that was required to clean the land of the foul state into which it had fallen during the war, and to bring it back to the condition of cultivation that existed in pre-war days. Certain facts were brought to the notice of General Wigan for him to deal with in Westminster. Thanks to extracts from the Faringdon Advertiser and Vale of the White Horse Gazette – All Rights Reserved. britishnewspaperarchive.co.uk. 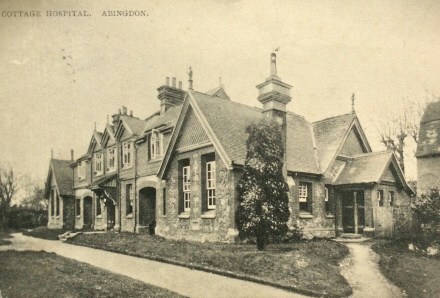 Also a 1916 Postcard of Cottage Hospital – Country Series 1489. 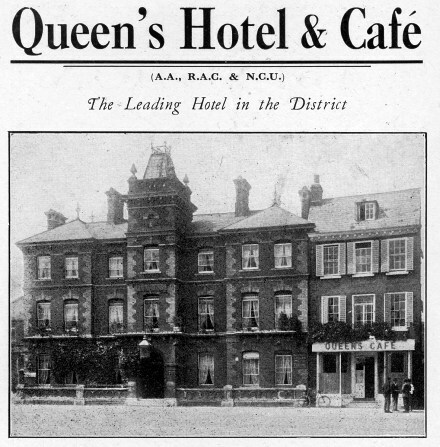 The 1924 Guide of Abingdon for the Queens Hotel advert. 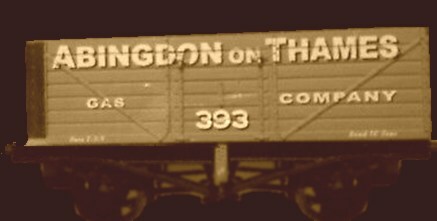 The Abingdon Gas Company carriage is a modern model railway carriage. 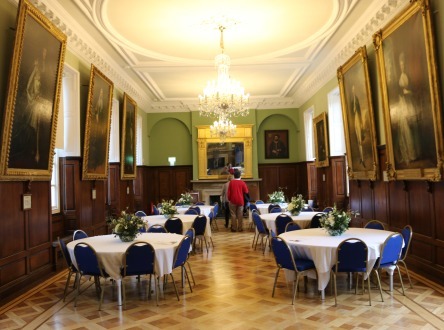 The Guildhall reopened today after a major refurbishment. 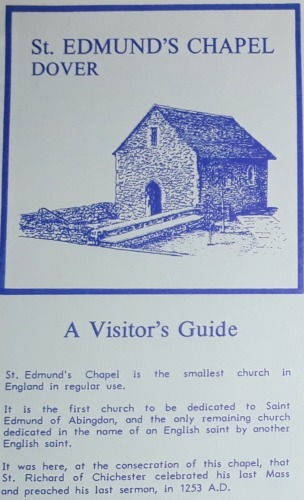 There were guided tours, or you could look round on your own and read the information sheets left in each room. A lot of people were taking the opportunity to visit, and it all looked fresh and interesting. Coffee was being served in the Roysse Room. Quite a few people said they remembered coming to a wedding there. The yellow ceiling with ornate white stucco, and white walls make this a bright room. 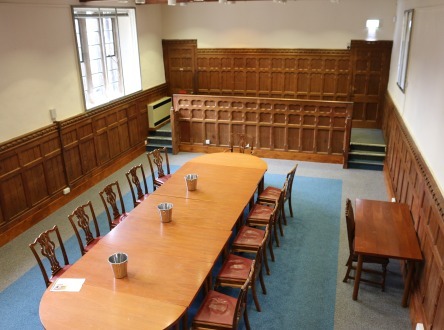 To show that it was once a schoolroom there was Greek on the balcony, and a birch rod in a case at the far end, donated by Old Abingdonian scholars. 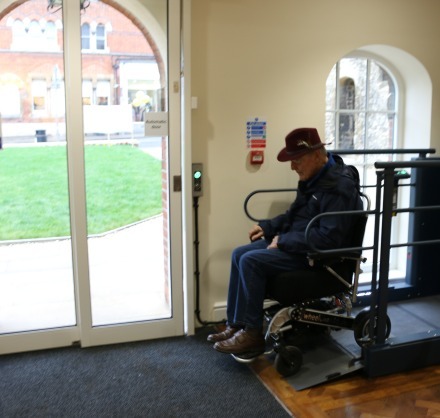 The new lift between the entrance and Magistrates Court worked well, but did need somebody to help open and close the lift gates and so does not seem to allow for full independence. The Magistrates Court looked fresh and tidy, and smelled of furniture polish. There was the sound of creaking floorboards from the room above. A table was in the centre so this, like two of the other rooms, was being shown as a meeting room. There was some talk of it being an exhibition space, also of audio visual equipment. I expect it will be multi-purpose. Upstairs, beyond any wheelchair access, the Bear Room had a shine on the table reflecting the grand window onto Bridge Street. There were paintings round the walls donated by Arthur Preston, the local historian and Alderman who was involved when the Guildhall was refurbished a century ago. He had documented things such as a hidden spiral staircase that came as such a surprise this time round, and appeared in the Herald. 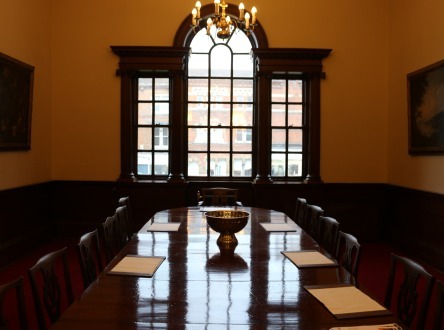 The council chamber, in two shades of green, had tables with cloths and floral decorations. The grand paintings were of Kings, and a Queen, and famous men with Abingdon connections. There was also a painting of Saint Sebastian being martyred. The Abbey Room, over the Abbey Gateway, had also been decorated with paintings, including one of John Creemer Clarke. The connecting room and toilets were very modern looking in comparison. Somebody said to me ‘All the rooms looked good. 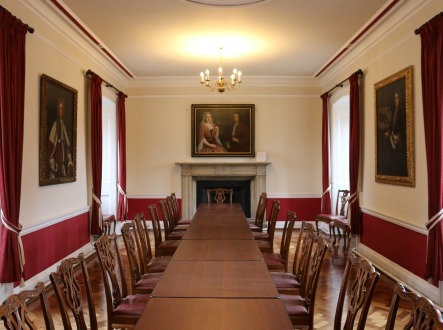 Something Abingdon can be proud of.’ Another person said ‘The room hire rates are reasonable‘. Another person said ‘A signal day for Abingdon‘. I would add that the information and tours were well organised. I only heard one complaint and that is that the Tourist Information is not in the Guildhall yet. There is no clear direction for tourists in Abingdon to go to the museum where it is housed. The Abingdon Prisoners’ of War Committee entertained the local returned prisoners of war and their friends at the Abingdon Corn Exchange, on Thursday evening last. The hall was gaily decorated with flags, and mottoes. The festivities included a substantial meat tea, followed by an excellent entertainment. The caterer was Mr Hathaway, who provided a large iced cake inscribed ‘Welcome to Home Sweet Home.’ The number of men entertained was nearly 50, and each was asked to bring a friend. The North Oxford concert party gave an entertainment in the Abingdon Corn Exchange, on Thursday last, in aid of St. Dunstan’s Hostel for the Blind. The programme was an excellent one, but there was a limited audience. Abingdon Philanthropic Society has just issued the balance sheet for the past year, which shows that with £31 1s 2d. brought forward from last year, £7 8s 10d. from interest and investments, and £37 11s 6d. donations and subscriptions, the total receipts were £76 1s 6d. Grants to applicants were £l6. £20 was placed to deposit account, and the expenses were 8s 4d. This allowed the sum of £30 to be carried forward. The report of the past year stated in reference the grants applicants that it is obvious that the continued high rate of wages and army pay the Society’s mission of relieving cases of distress amongst the industrious and meritorious poor has been somewhat limited, but heavy claims on the Society’s funds are anticipated on the return of more normal times. The Milton Red Cross Hospital is about to be closed for renovation but if military necessities prevail after the work is completed Mr and Mrs Mortimer Singer will again give up this beautiful residence in continuance of hospital work, but otherwise intend occupying themselves. The Nag’s Head public house on the Abingdon Bridge, which has been closed for some considerable time, and belonging to the Governors of Christ Hospital, had its license opposed by the Captain of the Salvation Army at Abingdon, Mr Dowse. The Abingdon County Bench renewed the license. The annual meeting of the Abingdon Fire Brigade was held last week at the Fire Station, Mr W. M. Coxeter, Chief Officer, presiding. The balance sheet, produced and adopted, showed that with £73 5s 1d brought forward, the annual subscription of the Abingdon Corporation of ten guineas, and sums from insurance companies, etc. gave the total receipts of £103 0s 4d. The expenditure was £16 13s 3d, leaving a balance of £86 8s 1d. The report mentioned that the Brigade had four calls during the year, one of which was outside the town. The staff was three officers and ten firemen, with two others serving in the Army. An inquest was held at the Abingdon Union on Monday, before Mr Coroner, on the death of John Lamer, an inmate. It appeared from the evidence that another inmate found the deceased on the lavatory floor on Sunday morning dead. Deceased, who walked with crutches, had slipped up and thereby hurt his head. At the County Bench in Abingdon the following school attendance cases were heard :- Robert Lardner, Botley, was fined 5s in respect of his daughter. Charles Lewington, Hinksey, was summoned in respect of his three children. P.C. Martin said when he delivered the summons the defendant said’he kept the children at home because he had pawned their clothes to get food. The case was adjourned for a month. Sgt. Harry Parker, son of Mrs Parker, West St. Helen Street, was named in Sir Douglas Haigs despatch of December 28th as worthy special mention during an engagement on that date. Pte. George Sparrow, son of Mrs Sparrow, 159, Ock Street, Abingdon, has been awarded the Military Medal for bravery shown on August 24th in engagement near Boiselle. The medal of O.B.E. 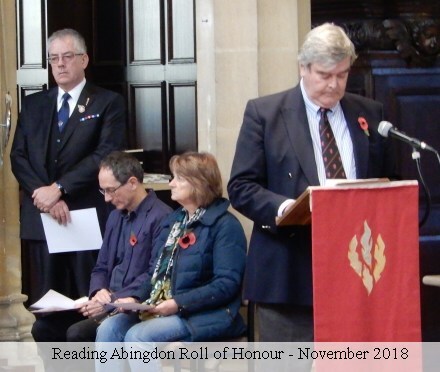 has been conferred on Mr Albert Trinder, a postmaster, son of Mr Alfred Trinder, 198, Ock Street, Abingdon, for courageous conduct during a fire which broke out in a military camp shed in which live bombs were stored. Pte. Fred Buckle, Royal Berks, son of Mr and Mrs Benjamin Buckle, of West St. Helen’s Street, Abingdon, is reported to have died whilst a prisoner of war in Germany. The number of Abingdon men and lads who have lost their lives during the war is considerable, 23 whose homes were in one street alone – West St. Helens Street, and six of those from one small court. The Abingdon Cottage Hospital report for the past year, just issued, states that the sum of £500 was received under the will of the late Miss Hyde, formerly of Abingdon, which has been invested in war loans. Alexandra Days, Abingdon in 1917-8 brought in £40 and £72 respectively. Another bequest falls to the hospital under the will of the late Miss Hutching, of Harwell. The in-patients during the year were 74, 18 of which were accidents. The total receipts from bequests, offertories, donations, etc., with £33 brought forward, amounted to £1,186 1s. 6d., and the expenditure £590 10s. The funeral of one of the victims of the sinking of H M.S Penarth, which hit a mine off the Yorkshire coast, took place at Abingdon Cemetery on Wednesday afternoon of last week. 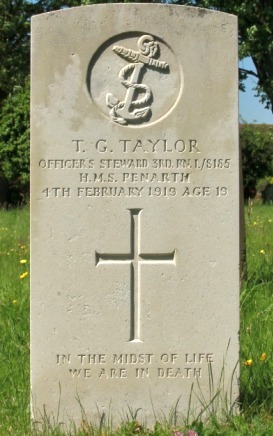 The deceased was Thomas George Taylor, officer’s servant, son of Mr and Mrs James Taylor, West St Helen Street, and had been in the Navy three years. There were several floral tributes and deceased was carried to the grave by sailor lads, the coffin being covered with the Union Jack. Several returned prisoners of war, and other sailors and soldiers on furlough attended the funeral service, and the Last Post was sounded by a bugler. At the Abingdon Borough Police Court on Tuesday, three Abingdon lads were summoned for letting off fireworks in the public streets, on Saturday evening last. Defendants pleaded guilty, and were dismissed with a caution. The Abingdon Horticultural Society have decided to hold the Abingdon Flower Show this summer, which was discontinued during the war. It is however, this year to on a modified scale in comparison with pre-war shows, and August 21st is the suggested date. 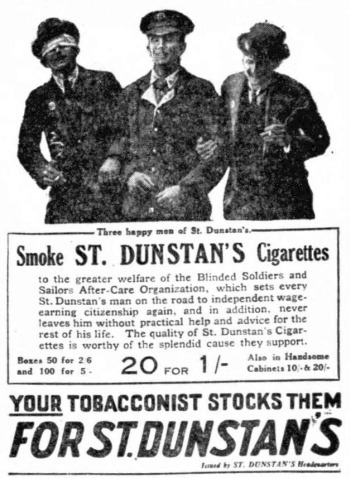 Thanks to the British Newspaper Archive for the stories and the Dunstan’s Cigarette advert and Abingdon hat images. 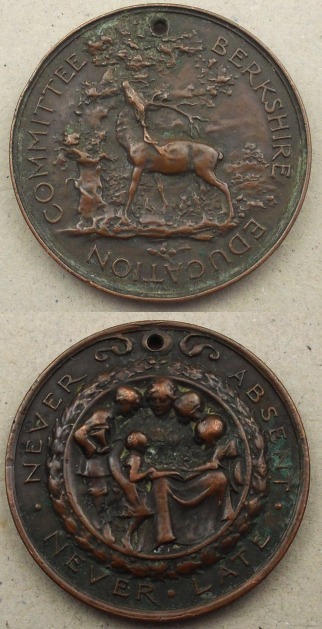 The Berkshire school attendance medal is being sold on Ebay. The gravestone is on Wikipedia. 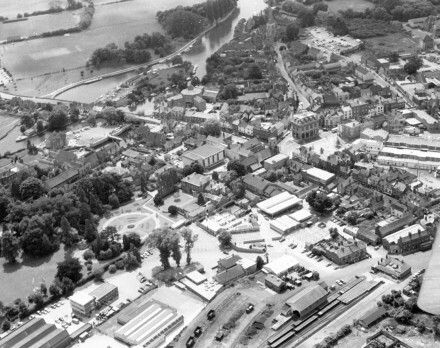 Thankyou to Malcolm for this aerial picture which expands the maps I showed a couple of days ago – on Abbey Close. The top wing of the de Havilland Dragon Rapide from which the picture was taken can just be seen in the right hand corner. 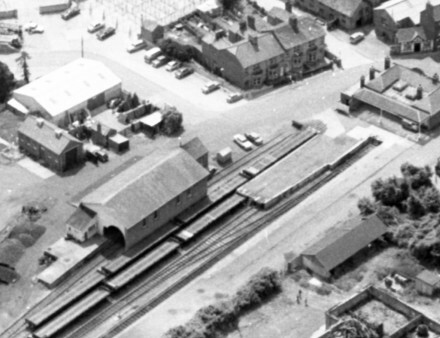 The railway station can be seen bottom right, the rolling stock are flat bed trucks which were used to transport MG cars. 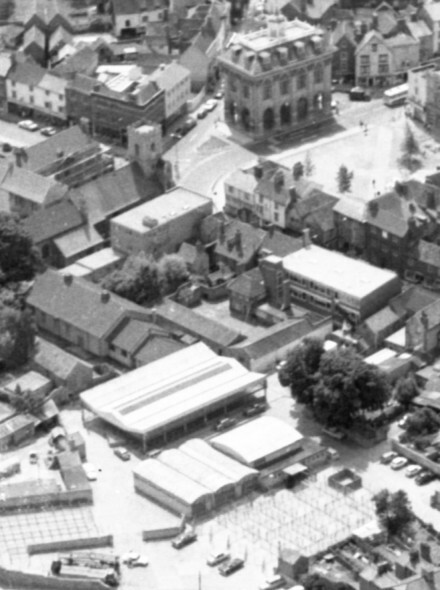 The pens of the cattle market can be seen in the area above that, together with St Nicolas Church hall.